This guitar has a 17 inch body with a spruce top, maple back, flamed maple sides, and walnut binding. 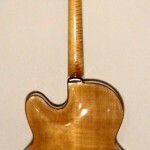 The neck is maple with a maple fretboard. It has walnut marker dots and walnut heal as well as a walnut lamination on the back of the headstock. This is a 24 fret guitar and they are all accessible. The pickup is a Benedetto S-6 floating pickup and is attached to the pickguard. 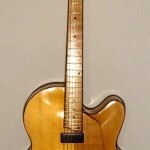 This entry was posted in Archtop Guitars by JakeS. Bookmark the permalink.